The Chimera (/kɪˈmɪərə/ or /kaɪˈmɪərə/, also Chimaera (Chimæra); Greek: Χίμαιρα, Chímaira "she-goat") according to writers, was a fire-breathing hybrid creature of Lycia in Asia Minor, composed of the parts of more than one animal. It is usually depicted as a lion, with the head of a goat arising from its back, and a tail that might end with a snake's head, and was one of the offspring of Typhon and Echidna and a sibling of such monsters as Cerberus and the Lernaean Hydra. Homer's brief description in the Iliad is the earliest surviving literary reference: "a thing of immortal make, not human, lion-fronted and snake behind, a goat in the middle, and snorting out the breath of the terrible flame of bright fire." Elsewhere in the Iliad, Homer attributes the rearing of Chimera to Amisodorus. Hesiod's Theogony follows the Homeric description: he makes the Chimera the issue of Echidna: "She was the mother of Chimaera who breathed raging fire, a creature fearful, great, swift-footed and strong, who had three heads, one of a grim-eyed lion; in her hinderpart, a dragon; and in her middle, a goat, breathing forth a fearful blast of blazing fire. Her did Pegasus and noble Bellerophon slay." The author of the Bibliotheca concurs: descriptions agree that she breathed fire. The Chimera is generally considered to have been female (see the quotation from Hesiod above) despite the mane adorning her head, the inclusion of a close mane often was depicted on lionesses, but the ears always were visible (that does not occur with depictions of male lions). While there are different genealogies, in one version the Chimera mated with her brother Orthrus and was the mother of the Sphinx and the Nemean lion (others have Orthrus and their mother, Echidna, mating; most attribute all to Typhon and Echidna). The Chimera finally was defeated by Bellerophon with the help of Pegasus, at the command of King Iobates of Lycia, after terrorizing Lycia and nearby lands. Since Pegasus could fly, Bellerophon shot the Chimera from the air, safe from her heads and breath. A scholiast to Homer adds that he finished her off by equipping his spear with a lump of lead that melted when exposed to the Chimera's fiery breath and consequently killed her, an image drawn from metalworking. The Chimera was situated in foreign Lycia, but her representation in the arts was wholly Greek. An autonomous tradition, one that did not rely on the written word, was represented in the visual repertory of the Greek vase-painters. 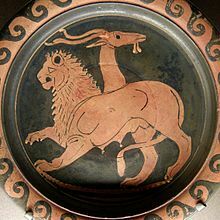 The Chimera first appears at an early stage in the repertory of the proto-Corinthian pottery-painters, providing some of the earliest identifiable mythological scenes that may be recognized in Greek art. The Corinthian type is fixed, after some early hesitation, in the 670s BC; the variations in the pictorial representations suggests multiple origins to Marilyn Low Schmitt. The fascination with the monstrous devolved by the end of the seventh century into a decorative Chimera-motif in Corinth, while the motif of Bellerophon on Pegasus took on a separate existence alone. A separate Attic tradition, where the goats breathe fire and the animal's rear is serpent-like, begins with such confidence that Marilyn Low Schmitt is convinced there must be unrecognized or undiscovered local precursors. Two vase-painters employed the motif so consistently they are given the pseudonyms the Bellerophon Painter and the Chimaera Painter. A fire-breathing lioness was one of the earliest of solar and war deities in Ancient Egypt (representations from 3000 years prior to the Greek) and influences are feasible. The lioness represented the war goddess and protector of both cultures that would unite as Ancient Egypt. Sekhmet was one of the dominant deities in upper Egypt and Bast in lower Egypt. As divine mother, and more especially as protector, for Lower Egypt, Bast became strongly associated with Wadjet, the patron goddess of Lower Egypt. In Etruscan civilization, the Chimera appears in the Orientalizing period that precedes Etruscan Archaic art; that is to say, very early indeed. The Chimera appears in Etruscan wall-paintings of the fourth century BC. In Indus civilization are pictures of the chimera in many seals. There are different kinds of the chimera composed of animals from Indian subcontinent. It is not known how Indus people called the chimera. In Medieval art, although the Chimera of antiquity was forgotten, chimerical figures appear as embodiments of the deceptive, even satanic forces of raw nature. Provided with a human face and a scaly tail, as in Dante's vision of Geryon in Inferno xvii.7–17, 25–27, hybrid monsters, more akin to the Manticore of Pliny's Natural History (viii.90), provided iconic representations of hypocrisy and fraud well into the seventeenth century, through an emblematic representation in Cesare Ripa's Iconologia. The myths of the Chimera may be found in the Bibliotheca of Pseudo-Apollodorus (book 1), the Iliad (book 16) by Homer, the Fabulae 57 and 151 by Hyginus, the Metamorphoses (book VI 339 by Ovid; IX 648), and the Theogony 319ff by Hesiod. Virgil, in the Aeneid (book 5) employs Chimaera for the name of gigantic ship of Gyas in the ship-race, with possible allegorical significance in contemporary Roman politics. Pliny the Elder cited Ctesias and quoted Photius identifying the Chimera with an area of permanent gas vents that still may be found by hikers on the Lycian Way in southwest Turkey. Called in Turkish, Yanartaş (flaming rock), the area contains some two dozen vents in the ground, grouped in two patches on the hillside above the Temple of Hephaestus approximately 3 km north of Çıralı, near ancient Olympos, in Lycia. The vents emit burning methane thought to be of metamorphic origin. The fires of these were landmarks in ancient times and used for navigation by sailors. The Neo-Hittite Chimera from Carchemish, dated to 850–750 BC, which is now housed in the Museum of Anatolian Civilizations, is believed to be a basis for the Greek legend. It differs, however, from the Greek version in that a winged body of a lioness also has a human head rising from her shoulders. Some western scholars of Chinese art, starting with Victor Segalen, use the word "chimera" generically to refer to winged leonine or mixed species quadrupeds, such as bixie, tianlu, and even qilin. ^ "The creature was a goat; a young goat that had seen but one winter was called chimaira in Greek". (Kerenyi 1959:82). ^ Hesiod Theogony 319–325 in Hugh Evelyn-White's translation. ^ Pseudo-Apollodorus, Bibliotheca 2.3.1: "it had the fore part of a lion, the tail of a dragon, and its third head, the middle one, was that of a goat, through which it belched fire. And it devastated the country and harried the cattle; for it was a single creature with the power of three beasts. It is said, too, that this Chimera was bred by Amisodarus, as Homer also affirms,3 and that it was begotten by Typhon on Echidna, as Hesiod relates". ^ Pindar: Olympian Odes, 13.84–90; Pseudo-Apollodorus, Bibliotheca 2.3.2; Hesiod, Theogony 319 ff. ^ Homer, Iliad 16.328–329, links her breeding to the Trojan ally Amisodarus of Lycia, as a plague for humans. ^ Anne Roes "The Representation of the Chimaera" The Journal of Hellenic Studies 54.1 (1934), pp. 21–25, adduces Ancient Near Eastern conventions of winged animals whose wings end in animal heads. ^ This outline of Chimera motifs follows Marilyn Low Schmitt, "Bellerophon and the Chimaera in Archaic Greek Art" American Journal of Archaeology 70.4 (October 1966), pp. 341–347. ^ John F. Moffitt, "An Exemplary Humanist Hybrid: Vasari's 'Fraude' with Reference to Bronzino's 'Sphinx'" Renaissance Quarterly 49.2 (Summer 1996), pp. 303–333, traces the chimeric image of Fraud backward from Bronzino. ^ W.S.M. Nicoll, "Chasing Chimaeras" The Classical Quarterly New Series, 35.1 (1985), pp. 134–139. Look up chimera in Wiktionary, the free dictionary. "Chimaera" . Encyclopædia Britannica. 6 (11th ed.). 1911. p. 164. 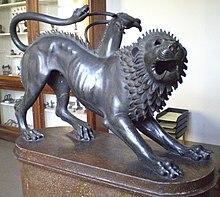 Wikimedia Commons has media related to Chimera.